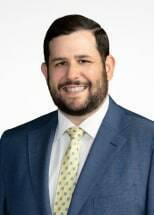 Michael Cohodes is a Houston native who prides himself on dependability, communication and trust, which makes him an asset to a broad range of clients. His background in real estate combined with his experience working with large and small companies give him a unique perspective that translates into success, regardless of the size of a transaction. Michael has a rare ability to develop strong relationships with people from all backgrounds and to provide understanding for many legal unique issues. As an approachable young practitioner, Michael is a passionate advocate providing sound legal advice and dedicated to achieving the best results in transactions.